It started with a cake. A rather innocent-looking cake, too, but that cake would open the door to opportunity - and disaster - for sweet-toothed, bargain-savvy Annabelle Pleasanton. In fact, between a promotion at work, her best friend's engagement, and her discovery of handsome photographer Isaac Matthews, that little cake has managed to turn Annabelle's world upside down. Things go from complicated to downright crazy as Annabelle discovers that handling her new writing assignment and plotting her friend's surprise bridal shower isn't going as easy as she'd hoped. Okay, okay - and appearing as a graceful, charming woman in the presence of Isaac is turning out to be, well, more than just a bit of a catastrophe. Not that Rona, a gorgeous boyfriend-snatching flirt, is helping things in the slightest. And just when things couldn't get any worse, smarmy womanizer Patrique worms his way into her life. Managing her life with the two of them in the picture may be more than she can handle. Now I want cake. I can't stop thinking about cake and buttercream frosting. This was a really fun book you guys. Super cute and sweet. It had all the makings of a great love story without being cheesy. You are actually being told the story by the main character. I liked this. It felt like we had a connection. She was telling me what I wanted to know. Annabelle feels like me. Or every girl out there. A bit disheveled and just trying to make her mark on the world. I like her. A lot. She's fun and crazy at the same time. I really like Issac too. He's the guy next door type. Yet, there were a few times I wanted to smack him upside the head. Come on Issac. Seriously?! Chill out. Just chill. Not every girl is the same as your ex. Annabelle writes these "pink notes" about influential people she has met and why they are important to the world. I loved this. I want to do this! They aren't people like the president but your everyday hero's who take the time to love and serve their fellow men. Really touching. 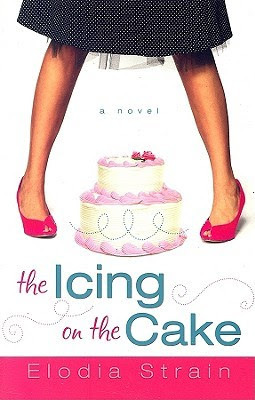 The Icing on the Cake is a totally fun LDS read. I just want to go back and read it all over again! Good thing there is another book to enjoy! Previously Engaged was even better!